As we round the corner into November, a kind of lethargy sets in. Doesn’t matter if you’ve just finished your first half-marathon (elation!) or you’re coming back to running after healing a injury (jubilation!) or you’ve just found running and the road is your new.best.friend. There’s something in the air—the dark, cold air—that combines with the craziness of the season (wait: I promised I’d host Thanksgiving this year at last year’s dinner?) that makes enthusiasm, time, and energy for the miles wane. At some point, you’ll glance up at the calendar—it’s mid-December already?—and your running shoes are hidden in the pantry, beneath a pile of spilled powered sugar. Never mind where your GPS or running tights are. Just the thought of running a mile feels like a marathon. Not this year, friends. You won’t lose your running shoes or your mojo; in fact, you’ll lace them up five days a week in STRIDE INTO THE HOLIDAYS, a five-week plan that will keep you moving with a spirited community of like-minded women and smart, doable workouts in the small pockets of time you have. Why hold a Challenge that starts in the darkest, busiest time of the year? Exactly. 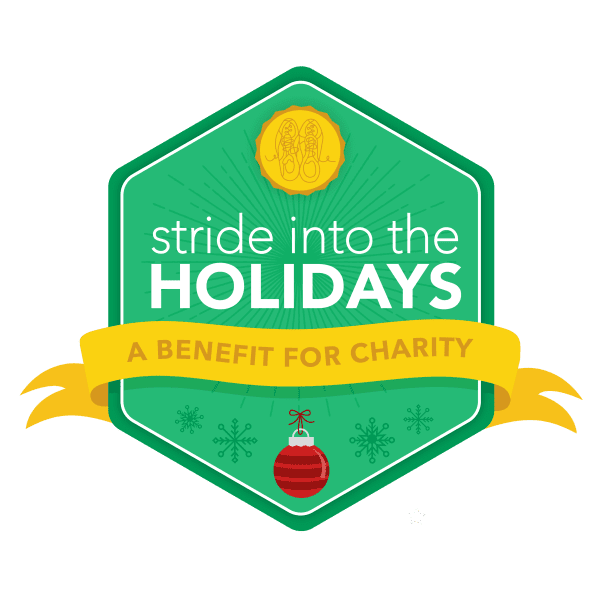 Stride into the Holidays is here to strongly encourage you to keep moving as you baste turkeys, hang a wreath, light the menorah, decorate cookies, shovel snow, and otherwise carry on through the most festive time of the year. (read: stay sane, keep smiling, burn some calories) In this season of giving, we also wanted to spotlight that 100% of profits goes to the charity of your choice: Heart Strides or 261 Fearless. A non-profit started by a Denise Dollar, a mother runner of two children including a son with Type 1 Diabetes. After her son was diagnosed, Denise let self-care—exercise, sleep, good nutrition—sink to the bottom of her to-do list, despite realizing how important her own health is. She also realized how financially draining extensive healthcare can be to a family budget. The money donated to Heart Strides provides new running shoes for moms with children who are critically ill or have a special need. Established in 2015, 261 Fearless is a global non-profit organization founded by pioneer runner Kathrine Switzer. 261 Fearless uses running as a vehicle to empower and unite women through the creation of local running clubs, education programs, communication platforms and social running events. The money donated to 261 Fearless will be used to train women how to set up 261 Fearless Running Clubs and increase their global reach to less developed areas in the world. What are Stride into the Holidays workouts like? We’ve pulled together five weeks of unique, fun workouts. (Hello #BAMR Bingo! Who is in?) The shortest workout is 20 minutes, the longest is 60-90 minutes (one longer run on the weekend), with most sessions clocking in around 30 minutes. Stride into the Holidays has you sweating five days a week, with an option for a sixth day if your schedule allows. It also has quick, helpful cues for self-care so your mind + spirit hum as your legs run. The workouts will have you primed and ready to tackle a training plan—or another Train Like a Mother Challenge!—when the calendar turns to 2018. If you are training and running by heart rate, you can definitely continue doing that with this plan. At least three of the weekly runs can be run easy effort. None, save a good pair of shoes and a supportive sports bra. You can complete all the workouts either from your home or in your home. Of course, you can always add weights or use a treadmill, but they’re definitely not necessary. What level of runner do I need to be to participate? Any level works. If you’re a beginner just starting to find your running groove, this will help you dig it deeper. If you’re coming off a fall marathon, this will keep you moving without burning you out. And if you fall somewhere on that sliding scale, Stride into the Holidays will also be a fit. Also, the plan works well for walkers and run/walkers. Forward movement, not speed, is the key element. How is Stride into the Holidays different than the usual Train Like a Mother Challenges? This five-week Challenge is all about forward motion, fitness, accountability and community, not about training for a specific race. The workouts are one-size-fits-all, and there is no swag, tee or medal. It is not linked into Training Peaks and there is no weekly newsletter. Instead, you’ll get a PDF of the plan when you register, and we will post workouts daily on the Facebook page. Another difference: 100% of profits goes directly to Heart Strides or 261 Fearless. Once you join Stride into the Holidays, we invite you to join a Strava Private Challenge club to track your miles, as well as a private Facebook page. On the Facebook page, we will list the workout daily so participants can comment on it, cajole each other to get it done, root each other on, share pictures, and otherwise engage that entertaining, time-killing, helpful way Facebook allows. $25, and 100% of the profits goes directly to the charity of your choice, Heart Strides or 261 Fearless.